Sunday morning brought rain (earlier than forecasted), but we all drove down to Sharon for another great Max Performance event. There were 7 of us racing and we all did our best to keep some of our gear dry, keep ourselves warm, and keep our energy levels up! Kristi and Becky came to cheer and my husband, Scott, was armed with the camera. It was a choppy 1/2 mile swim on the lake due to the storm, but everyone kept their cool…especially Ruth when someone kicked her in the face!! 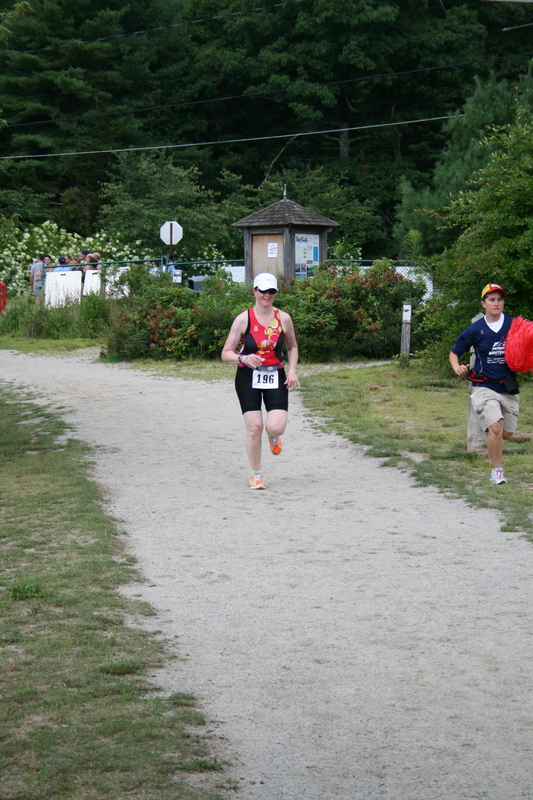 I was fighting with my wetsuit in transition when I heard, “Way to go Rachel!” I looked up to see Laurie flying through from the swim to bike. Boy is that woman a fish! 🙂 She started a good 2 waves behind me! Off on the bike for a flat, fast course. Had to be careful in the corners because of the rain and it was bumpy in places, but otherwise it was beautiful. And the wildlife just seems to keep finding Jenn….while she was riding a huge buck came out of the woods and went right across the road in front of her!! Yep, a buck! With antlers! I know! Crazy! We were back into T2 before we knew it. The run was long (for me at least) at 4.4 miles, but all flat, very scenic and boy were we thankful for the cloud cover now. Coming back in towards the finish with only .2 miles to go my legs were like bricks and I look up to see Kristi standing in the middle of the road hollering my name and shaking pom-poms!! What a sight!! She ran the last of the way in with me…what a savior! This was my first full triathlon since having foot surgery, and my longest run to date, so having her smiling, cheering and running with me was very uplifting at that moment. I didn’t place at this race, nor do I think I ever will, but that’s not why I love this sport or this team. I love it for the comraderie, the friendships, and the tests of endurance we all put ourselves through. To finish the race smiling and under my own will is always a “win” in my book.